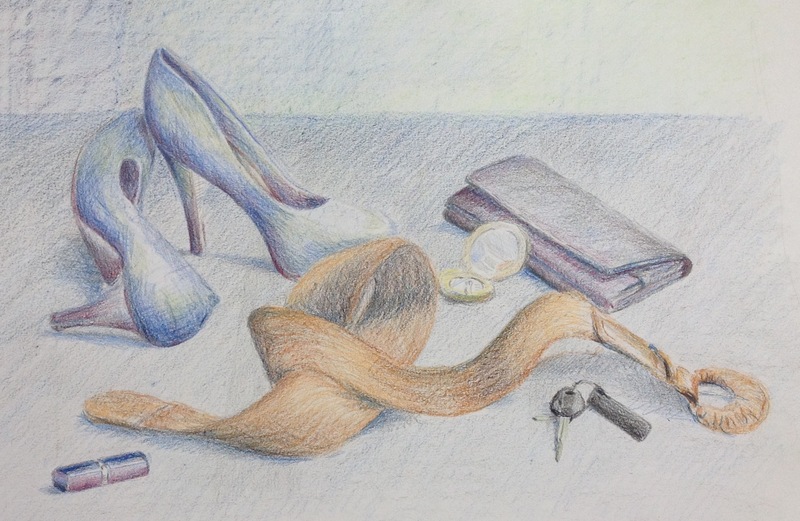 Project 2- Exercise 2 : Still life in tone using colour. I chose these objects because they created a moment in time ( things discarded at the end of an evening) but also because I liked their shape and colours for this exercise. I initially started this exercise outside for the strong light but when the weather changed I moved indoors by a window. Not having used coloured pencils much, it surprised me how many layers of colour are needed to make the objects look solid. However, by arranging the objects in front or behind each other , it helps to create a sense of depth. The line where the floor meets the wall and the shading also add to this. I really like the way the different colours work together to depict tonal differences and plan to experiment further with this medium. What I found difficult when focusing on tone, was being unable to describe the detailing and texture of the belt. I have tried to use a limited range of colours and have used blue throughout to try and tie it all together. I also tried a little bit of Frottage at the back wall to give an impression of a brick wall. Generally I am happy with this drawing although I can’t say I achieved working quickly.